Oct 21, 2014 | This post may contain affiliate links. Learn more. New York-based suit startup Black Lapel recently unveiled their Fall 2014 suiting fabrics and invited Modern Fellows to take a look. An outstanding contender in the world of custom suiting from the start, Black Lapel’s founders Derek Tian and Warren Liao continue to iterate on fit, fabrics, offerings and design in ways that seem deliberate and conscious of a long-term strategy. Black Lapel has been introducing handfuls of new fabrics for suits and blazers each season. Their 2014 collection features several fall-appropriate options including a new gray suit with a lively purple windowpane and a blue gray birdseye suit. The company sent along a charcoal brown suit with blue overcheck from the 2014 collection at no cost for Modern Fellows to review. The Super 110 fabric feels high-end and – though this may be my imagination — a hair weightier than their everyday suit. The overcheck is visible up close but, from far away, mostly adds texture and interest to a brown suit that is a great choice for fall and winter. 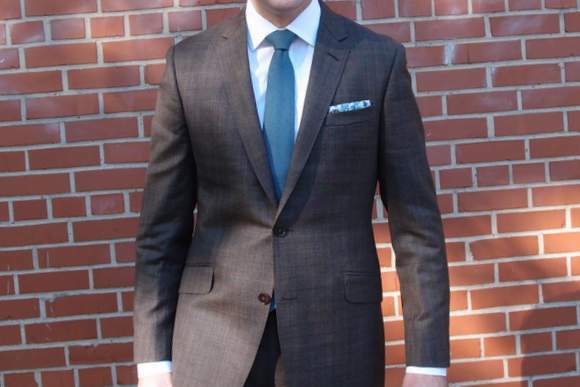 The team at Black Lapel has also been iterating on the cut of the suit and the finishes. The shoulder changes are subtle but improve an already impressive offering. The company has also made small adjustments to their patterns based on customer experiences. Black Lapel also added some new standard options – available online during the ordering process – and series of “secret” customization options that are available to those who know to request them. One of those customization options – the barchetta chest pocket (pictured below) – is featured on this suit. If you want to know the rest, you’ll need to poke around the Internet or have a conversation with the team at Black Lapel. To go along with all of those fit, finish and fabric changes, earlier this year, Black Lapel revamped their website, creating a cleaner face for its clients that features more detailed and customer-friendly photos and zoom functions that had been lacking on the old design. Black Lapel consistently impresses with fabrics, finishes and customer service. Their 2014 fabric line — combined with the updated fit and finishes and still-stellar customer support — is no exception.